A brilliant series that combines the underlying dread of Cold War spy-thrillers with the writings of H.P. Lovecraft, with a liberal dashing of geek humour for good measure. Currently due for book six this year, the Laundry Files can be intimidating for casual readers. The Laundry Files are a fantastic series of sci-fi novels about IT-nerdery, British bureaucracy and Lovecraftian horror. Those who have worked within the public sector will understand all too well how these elements can come together. 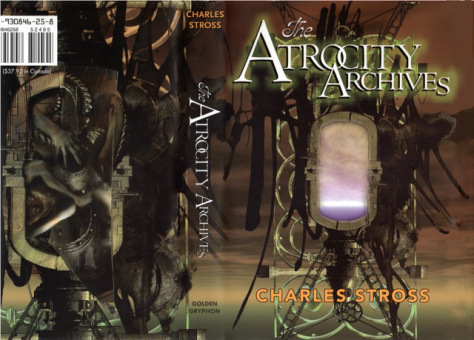 For those who have not had the pleasure of meeting Charles (“Charlie”) Stross, he is a colossal geek, and a literary one at that. He graduated from university with a degree in Pharmacy and later studied a post-graduate degree in Computer Science, which quite probably makes him the world’s first certifiable cyberpunk (shortly before it no longer became cool). His impressive timing continued when he moved to a dot.com company, just as the dot.com bubble burst. Since the mid-nineties, Charlie Stross has been writing various forms of science-fiction, from the near-future Halting State series through to the space-opera of Saturn’s Children series. However, his books in The Laundry Files are perhaps his most inventive. Underlying all this is the humour that runs through the tales, referencing geek culture, government bureaucracy, IT nerdery and just about anything that happens to be percolating within Charlie’s brain at the time. The general idea behind the world of The Laundry Files is that advanced mathematical equations are just another method of magic. Thus, computers, smart phones and MMOs are all watched to ensure that no one accidently wipes out Wolverhampton through a poorly thought-out computer rendering algorithm. The Laundry Files begins with The Atrocity Archives (released in 2004), which was inspired by the Len Deighton’s tales of out-of-place bureaucrats. It is in this novel – which is made up of a series of interconnected tales – that we first meet Bob Howard, a former IT consultant and now field agent for the Laundry, where he tries to stop time-travelling Nazis and psychotic fundamentalists. The Jennifer Morgue was the 2006 sequel to The Atrocity Archives and is perhaps the most accessible of all The Laundry Files. Here, Charlie Stross was inspired by the writing of Ian Fleming, and, as the character of James Bond is universally renowned, the references and beats of the story are more prevalent. Nonetheless, Charlie’s style of blending horror and humour continues unabated, as well as his subtle jibes at Microsoft and Apple. The next Laundry novel was The Fuller Memorandum and was this time inspired by Anthony Price, whilst the fourth novel (The Apocalypse Codex) was written in the style of Peter O’Donnel (writer of Modesty Blaise). From this point onwards, Charlie had sufficiently established the style of The Laundry Files, such that he no longer felt the need to continue echoing other spy-thrillers. Thus Rhesus Chart and The Annihilation Score are both pure Charlie. Each of the books within The Laundry Files is independent, but there nonetheless remains an ongoing plot (the “CASE NIGHTMARE GREEN”) that the series is building towards. In fact, Charlie has already planned the next three books in the series, with The Nightmare Stacks due this year, The Delirium Brief due in 2018 and The Golgotha Graph also planned. The first two novels in The Laundry Files also include a short story at the end. These may not inform upon the core storyline of the novel but are entertaining snapshots into life in the Laundry (Pimpf in The Jennifer Morgue is a great tale about MMOs and interdepartmental politics within the Laundry). These novels also conclude with an essay by Charlie about the inspirations and influences behind the writing of the novel and are just an entertaining.